Based on the Jeep Renegade, the Jeep Comanche concept is off-road ready with practical utility. A nod to Jeep pickup trucks of years past, the Comanche concept takes styling cues from military and civilian Jeep heritage. 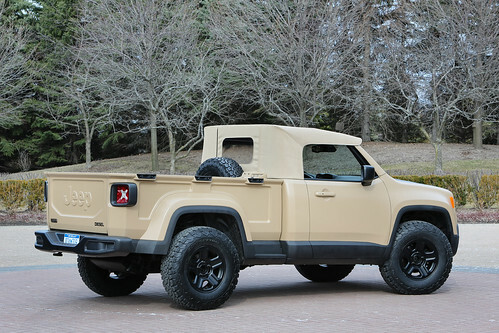 The Comanche’s “Beige Against the Machine” concept exterior paint is accented with a Satin Black hood, a concept lower front fascia, winch, steel rear bumper, soft top and spare tire in the bed. The wheelbase has been stretched an additional six inches, compared to a production Renegade to accommodate Comanche’s 5-foot bed. Inside, the Comanche features custom seat covers, pedal covers, door sill guards and Mopar all-weather mats. Jeep Performance Parts like off-road rock rails, a 2-inch lift kit and a winch bolster the Comanche’s off-road capability. The Comanche rolls on 16-inch painted wheels and 32-inch BF-Goodrich All Terrain T/A tires.